Shingles, medically named herpes zoster, is a disease of the skin that commonly manifests itself as chicken pox in children and teenagers. 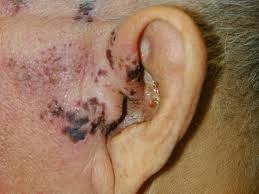 While the disease affects the entire body, a derivative of the disease, herpes zoster oticus, affects the ear. The early symptoms of herpes zoster are headaches, fevers, chills and a spreading rash. Symptoms of herpes zoster oticus include hearing loss and dizziness. Pressure on the nerves around the ear causes the hearing loss as the disease spreads to the facial nerves. 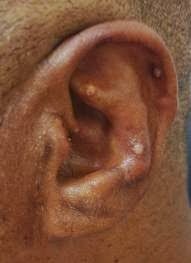 Rash: Ear shingles may begin with a rash in the tympanic membrane. Vesicles (small sacs similar to cold sores) appear on the neck as the rash continues to spread outside the tympanic membrane. Loss of Taste: In some ear shingles cases, loss of taste happens on the nerves located on top of the tongue. Symptoms on the Ganglia of Corti: Involvement of ganglia of Corti (located in the auditory nerve) is accompanied by tinnitus, vertigo, nausea and loss of hearing.